The RCN has raised concerns about an ‘unprecedented’ move by a hospital in Northern Ireland to allow trained volunteers to sit with patients awaiting emergency treatment. Antrim Area Hospital invited the St John Ambulance volunteers, who worked under the direction of registered nurses, to alleviate pressure on staff due to a high patient attendance rate on New Year’s Eve. RCN Northern Ireland director Janice Smyth said: ‘This is heading only in one direction and, in the absence of a workforce plan, this is highly dangerous. She added that there were 1,500 nursing vacancies waiting to be filled in Northern Ireland. A St John Ambulance spokesperson said the volunteers are well trained and that their actions on New Year’s Eve were ‘nothing spectacular’. 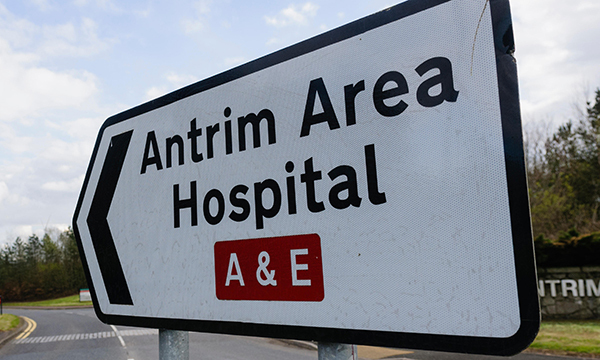 The Northern Health and Social Care Trust, which runs health services in Antrim, said the hospital was under severe pressure due to a high number of attendances of very sick and vulnerable people. A trust spokesperson said: ‘We made appeals for our own staff to come into work if they were not on shift but were available, and also used the services of bank and agency nursing staff. ‘As will be appreciated, resources were extremely stretched over the holiday period. ‘We have an active programme of volunteering at our hospitals, and, during the New Year period, St John Ambulance volunteers worked at Antrim Area Hospital. The trust said the use of volunteers was complementary to core staff but that they did not substitute registered nurses. A Health and Social Care Board spokesperson said that from Christmas Eve to New Year's Day, 15,626 patients were treated at Northern Ireland’s main emergency departments. This represented an increase of 4% compared with the same period the year before, and a 14% increase compared with 2015-16. A total of 928 people had to wait longer than 12 hours to be seen, treated and either discharged or admitted to hospital.